AAT RV data for HD 118475, shown as yellow points, and the best-fit model, shown as a blue solid curve. The unphased data with residuals are shown in the top panel, and the phased data are shown in the bottom panel. Image credit: Kane et al., 2019. Using radial velocity method and direct imaging, astronomers have found a compact companion of a nearby star known as HD 118475. The finding is detailed in a paper published March 11 on the arXiv pre-print server, in which the authors reveal fundamental parameters of the system and discuss the nature of the newly found companion. Located approximately 107 light years away from the Earth, HD 118475 is around 12 percent more massive than our sun, has an effective temperature of nearly 5,900 K, and a metallicity at a level of about 0.07. A team of astronomers led by Stephen R. Kane of the University of California, Riverside, has conducted radial velocity observations of HD 118475 looking for any objects, mainly planets, accompanying this star as part of the Anglo-Australian Planet Search (AAPS). For this purpose, they employed the UCLES high-resolution spectrograph on the 3.9m Anglo-Australian Telescope (AAT) located in Australia. The over decade-long observational campaign of HD 118475 resulted in finding evidence of a compact companion to this star. The discovery was confirmed by follow-up direct imaging observations with the Differential Speckle Survey Instrument (DSSI) instrument on Gemini-South telescope in Hawaii. "Radial velocity (RV) searches for exoplanets have surveyed many of the nearest and brightest stars for long-term velocity variations indicative of a companion body. (…) Here, we present the discovery of a compact companion to the nearby star HD 118475," the astronomers wrote in the paper. The observations found an object moving on a 2,070-day orbit, at a distance of some 3.69 AU from HD 118475. The researchers calculated that the minimum mass of the newfound companion is about 0.44 solar masses and the system is approximately 4.1 billion years old. According to the study, the researchers initially supposed that the companion is most likely a previously undetected main sequence star. However, data from DSSI ruled out this possibly and provided evidence suggesting that this object is most likely a white dwarf. 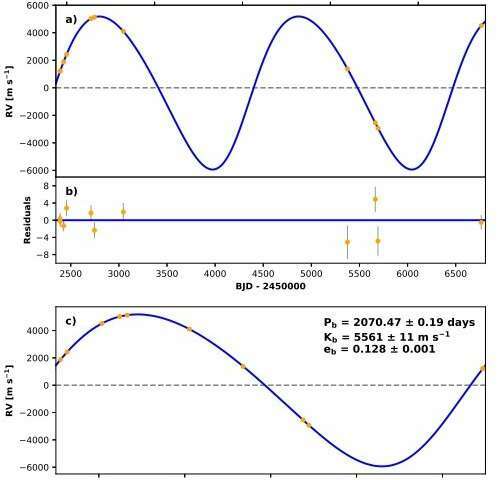 "The source of the periodic RV signal observed for HD 118475 must therefore be a compact object, most likely a white dwarf based on the range of possible orbital inclinations," the paper reads. Given that many parameters of the system remain unknown, more observations are required in order to unveil the true nature of the companion. For instance, future data releases from ESA's Gaia satellite have the potential to reveal the companion's exact mass. Moreover, further direct imaging observations with greater sensitivity could be also helpful to confirm the white dwarf nature of the newly found object. "In the future, the release of data obtained by the Gaia mission will allow the orbital inclination of the system to be determined with exquisite precision which, in combination with the existing RV data, will produce a measurement of the companion's true mass," the researchers concluded.